As you see, it only shows the functions. We want it to create a browsable tree with the CherryClass at the top level, sections as children of the CherryClass, and functions as children of the sections. First, CherryPy uses an extension of Python classes called CherryClasses, identified by the keyword CherryClass. 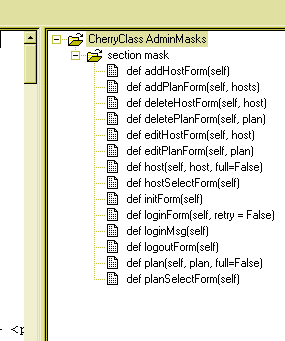 CherryClasses are divided into multiple sections called variable, aspect, mask, view and function. We need to make PyPe code parser aware of these keywords. The function we must modify is called fun and is a method of the function fast_parser in the parsers.py file. The fun function starts at line 35 (for PyPy 1.9.3). The relevant code is from line 100. Wohoo!!!! Just what we wanted!!! One more thing to do is to modify the file browser so it associates .cpy files with Python/CherryPy. I’ll leave this as an exercise to the reader. 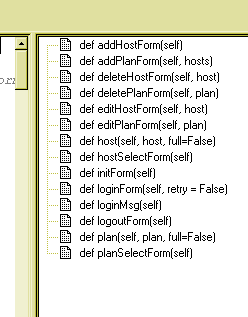 Look at the code at line 101 and below in configuration.py and it should be quite easy. This entry was posted on Friday, August 20th, 2004 at 11:21 pm	and is filed under CherryPy, Editors, Python. You can follow any responses to this entry through the RSS 2.0 feed. Both comments and pings are currently closed.